Damn good news for all Modul8 lovers – the brand new version which got a new name – Modul8 HD V3.0 – is able to playback 20 layers of HD content easily and supports up to 8k videos. A brand new HAP and H.264 media player engine is the key and should step up the game. Also 4 years after the first retina display got to the market the M8 interface is now optimized for retina displays. The developer team is on the right way to get back in to business of high resolution and up to date technology and it’s exciting to see what artistic projects will be created in the near future with their technology. 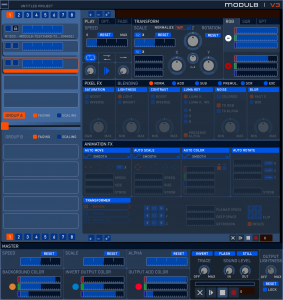 If you’re a Modul8 2.9 user you should head over to the Modul8 page and give a try to the BETA version. Beside all that you can get a free modul8 t-shirt if you report an undiscovered bug or explain how to reproduce a crash by sending an email to: beta[AT]garagecube[DOT]com . * Saves video Preview mode when quit. We also added useful new features to add comfort for the user experience like a new User interface now compatible with retina display screens. You can now lock a layer to prevent from deleting or editing an important asset of your show. 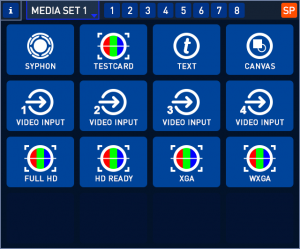 New 8 Media set groups : you can now handle up to 1024 media in a single project. This Public Beta version is available from today for any users who own a serial which is compatible with modul8 2.9. To download it, click on the button or log on the modul8 yourspace page us gin your modul8 serial.